We here at On Sandwiches have never made any bones about our deep and abiding love for the pulled pork sandwich. In August, we are showcasing some of our recent pulled pork experiences and seeing how they stack up against one another, and against our idea of what a pulled pork sandwich should be. Lucille’s Smokehouse is a chain of BBQ restaurants in California, Nevada, and Arizona. They smoke their meats in-house and offer fine, traditional barbecue fare with ample portions. I have eaten there before and been extremely pleased. 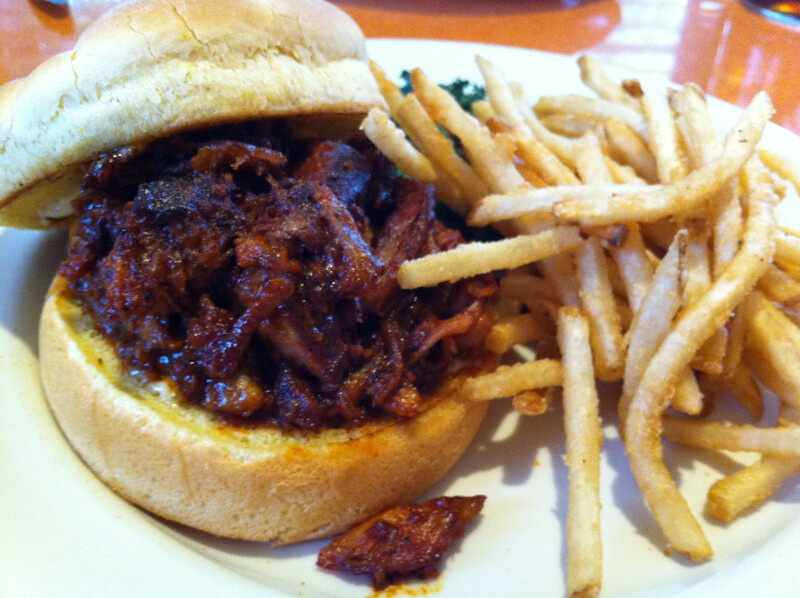 Lucille’s offers three different pulled pork sandwich options: Original, Memphis Style, and Carolina Style. As we shall get into in future Porkstravaganza posts, the type of sauce offered with a pulled pork sandwich can, more often than not, tell the entire tale. I opted for Carolina Style, and I believe this is where I made my mistake. I am a fan of spicy foods, although it must be in moderation. I am not one of those types who seeks out “the hottest hot sauce known to man” as a lark. Nor am I the type of person who, seeing a menu where the hot sauce options are presented in a graph resembling a thermometer, would motion anywhere near the top third when making my selection. Lucille’s billed their Carolina Style pulled pork sandwich as being tossed in a “tangy” East Carolina BBQ sauce. When I think of the word “tangy,” it does not begin to describe what occurred when I took my first bite of this sandwich. I inhaled sharply, my eyes watered, and I fumbled for my water glass. This was beyond “tangy,” my friends. The sauce was so overwhelmingly hot, that I could scarcely finish the sandwich. The smoked pork, although fine, was lost in the heat of the sauce. It was a decent sandwich, and would have been just the thing if I were in the mood for an overwhelmingly spicy meal, but I will stick to less “tangy” options in the future. This entry was posted in General Sandwich Discussion, Sandwich Reviews and tagged Anaheim, Pork, Pulled Porkstravaganza, Reviews by Bill, Sandwiches I Have Eaten by bengrimm. Bookmark the permalink.